A second-grade teacher (Kayla Delzer) in North Dakota created “Genius Hour” in her classroom: one hour per week in which students could go off and learn about a topic of their own choice, to become mini-experts in whatever interested them, unconstrained by the curriculum. This is amusing and sad at the same time. Also mystifying. The first time this happened, I went blank. I couldn’t understand the question. I could talk about how I was drawn to computer science because I did a lot of sci-fi reading and was captivated by the ideas and what-could-be — but I’ve never thought about having a process of “figuring out” what I would be interested in. You just know. The second time it happened, I replied, “Well, I guess it’s like asking how you know what your favorite color is!” — which is true, but not very useful. And I felt unsatisfied with myself, like I was missing something. Why would anyone ask that question? Could you really not know what your own interests are? Could you really… not have any? Dintersmith’s story suggests one answer — that students are over-structured and expect there to be a “right” answer to everything and want to know how to get there. It comes from without, not within. I don’t think I have a good answer to that one either, since effectively I went after what I thought was most interesting and it was dumb luck that it also ends up being something people will pay you to do. I wasn’t really aware of the job market while I was a student. But now at least I may have something more useful to say, by turning back to the students and asking if it’s really concerns about employability, rather than a lack of personal interests, that they’re worrying about. Fascinating. I just finished reading “Quiet: The Power of Introverts in a World That Can’t Stop Talking,” which makes me want to talk! 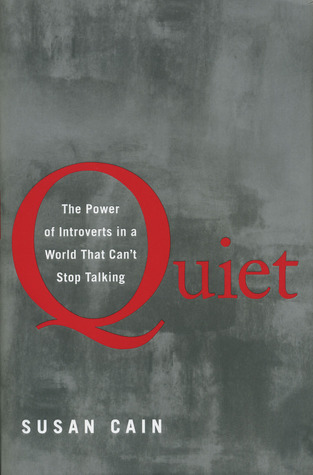 Cain’s book is a fascinating account of the latest research on introverts and extroverts. It pulls together ideas from antiquity up through today about what distinguishes these basic personality types, how they form (nature vs. nurture? ), and what their strengths and weaknesses are. Cain’s tone throughout is a bit defensive or apologetic (hence the title’s emphasis on the “power” of introverts) due to our cultural bias in favor of extroversion – but both sides are discussed. Introverts will find advice herein about how to connect, communicate, and thrive (and know yourself better). The main message I got (which fits my own life experience) was that introversion is likely an inborn trait (not an environmentally imposed one), but we can (and do) adapt to situations as needed, including performing as extroverts if it’s in pursuit of a goal that we highly value. One aspect of introversion that was new to me is that introverts tend to be more sensitive to the thoughts and actions of others. I am reminded of how I would anthropomorphize everything as a kid, including feeling sorry when I stepped on rocks in case it “hurt” them. Here I’d thought that everyone did that :) And it’s true that I find it nearly impossible to rest if I think I’ve inconvenienced, hurt, or annoyed someone. I feel compelled to address and resolve it. I was also surprised to read that “at the university level, introversion predicts academic performance better than cognitive ability” and that “introverts receive disproportionate numbers of graduate degrees.” Cain does not argue that introverts are smarter than extroverts (in fact, she points out that IQ tests show no difference), but that they are more focused, invested, and studious – traits that are rewarded in academia. In contrast, extroverts are better at “handling information overload,” perhaps because introverts are devoting “cognitive capacity” to reflecting on experiences as they are happening. I can identify with that! But the part that really hit me hard was the discussion of being “reward-oriented” versus “threat-oriented” (one way of thinking about extroverts and introverts). Reading through this characterization, I realized that this theory captures my own behaviors remarkably well. And I went through a short existential crisis, because this is not how I have ever viewed myself consciously, and it felt like a disappointment. While there are up sides to being cautious and conscientious and thorough, it seems … less impressive, somehow, than being a risk-taker and go-getter and achiever. I’m not sure that I want to think of myself as motivated by fears. An industrious individual converted Cain’s short 10-question quiz into an online quiz, so if you don’t have access to the book, you can still determine where you fall on the reward-threat spectrum. Cain shares the results of studies on how well people think and work in solo situations versus group settings, with important implications for your own productivity and for the workplace. She makes some powerful points about the need for both introverts and extroverts for balanced decision making (e.g., in financial markets, but everywhere else, too). There are also chapters devoted to the teaching or parenting of introverts. I found these less compelling or insightful. The main message is about awareness of diversity in personalities and strengths. As an introvert myself, I find the recommended strategies to be overly meddlesome, but it’s always possible that others would find them beneficial. Overall, this was a thought-provoking read that yielded some new insights about myself and my behavior. I wrote extensively in the margins and will likely come back to browse and review over time. In Joshua Foer’s excellent book on the art of memory, Moonwalking with Einstein, he mentions the “OK Plateau” as something that all humans learning anything will encounter. This is the stage you reach once you’ve moved past “beginner” and are able to execute a task with some degree of automation. For example, when you first learn to type, you look for and consciously press the right keys. But at some point you learn where they are and can type without looking (or really thinking about individual keys). Foer pointed out something I’ve always wondered — if we tend to get better at something over time, why doesn’t everyone end up being a 100+ wpm touch-typist? The “OK Plateau” is reached when you are doing a task “well enough” for your needs, and your brain moves on to focus its conscious effort on something else. So even though you might be typing every day (email, reports, documents, forms), you probably will settle into some particular typing speed that never really improves. This is fine for tasks in which “good enough” is, well, good enough. But there are some things in which you want to become an expert, or at least push your performance to a much higher level. To do that, it seems, you must push yourself back into a conscious awareness of what you are doing and examine and explore where you are making errors or performing suboptimally. This means constantly pushing yourself to do more, work faster, tackle harder examples, and so on, and then to learn from your failings or mistakes. I have been thinking about this in terms of my pilot training. There are significant parts of flying that I can now do with some degree of automation, and it is tempting to declare them “learned” and move my tired brain on to the other big poles. But it is also clear to me that complacency is not something you want to develop in flying – nor in driving – nor anything else that requires a good depth of experience and tuned reflexes. I’ve come across advice in different pilot venues that urge you to continue polishing and refining. How precise can you make your short landing? How precise can you be on airspeed and altitude? If you picked out an emergency landing spot, fly low and actually check it out. Is it as obstacle-free as you thought from higher up? I expect there is probably a transition you hit once you get your pilot’s license. You go from regular lessons with an instructor (with performance expectations and critiques) to absolute freedom to fly when you want, where you want, with no one watching over your shoulder. At that point, it is up to you to maintain that same level of scrutiny and to critique your own performance. My instructor told me to always have a specific goal when I go out to do solo practice. I’ve encountered the recommendation that, after landing, you give yourself a grade for every flight. What did you do well? What was borderline? What new questions came up that you should research? Foer describes chess players who learn more from studying old masters’ games (and reasoning through each step) than from playing new games with other players. Studying past games can be more mindful. Pilots can benefit similarly from reading through accident reports to gain knowledge about how things go wrong. AOPA offers a rich array of Accident Case Studies that provide a wealth of scenarios to think through and learn from. For any hobby or skill, there are similar opportunities to make your practice time more effective at increasing your ability. Instead of playing through your latest violin piece, try doing it 10% faster and see what happens. Try transposing it to a different key on the fly. On your next commute, grade yourself on whether you maintained a specific following distance, how many cars in surrounding lanes you were consciously tracking, how well you optimized your gas mileage, or some other desirable metric. Employing this approach to everything you do would be exhausting and impossible to maintain. But for those few things that really matter to you, for which the OK Plateau is not good enough, it could be what catapults you to the expert domain. If you’re interested, check out Foer’s short talk summarizing the OK Plateau and his advice for escaping it.